A fascinating look at the claims of the Gospel writers and 2,000 years of believing Christians. Bestselling author Josh McDowell and his son Sean examine the compelling evidence and conclude that Jesus Christ conquered death and the grave! 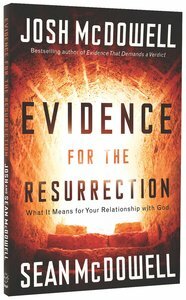 In clear, concise and accessible chapters, Josh and Sean present the facts about the resurrection and what it means for readers today. About "Evidence For the Resurrection"
When Jesus died on the cross, it seemed that all had been lost. Death had won. But after three days in a rich man's tomb, Jesus appeared…alive! The news was so shocking that His followers refused to believe it until they saw Him with their own eyes and touched His wounds with their own hands. Then Jesus made an amazing claim: In the future, they too would have resurrected bodies like His, bodies that would never deteriorate, age or perish. They would have new life without death or pain in the presence of a loving God forever. But can we really believe His promise? For that matter, can we really believe that the promise was made by a Man who rose from the dead? In this fascinating look at the claims of the Gospel writers and 2,000 years of believing Christians, bestselling author Josh McDowell and his son Sean examine the compelling evidence and conclude that Jesus Christ conquered death and the gravel in clear, concise and accessible chapters, Josh and Sean present the fact s about the resurrection and what it means for readers today.